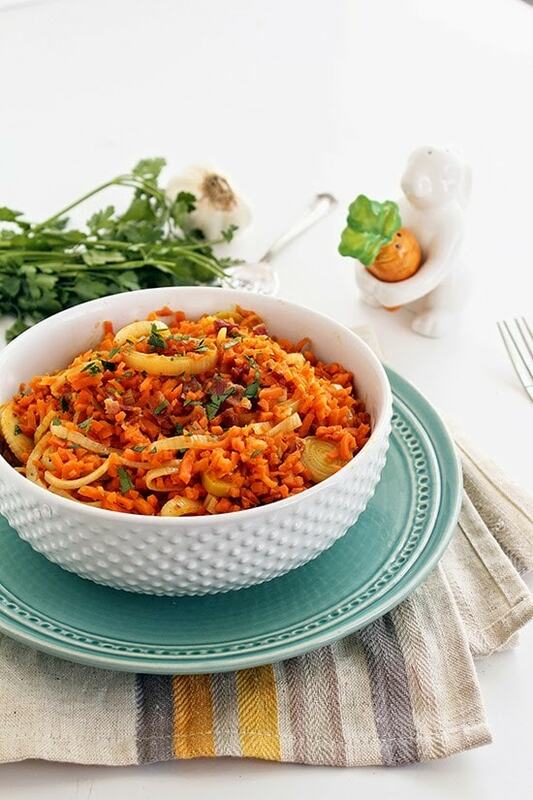 While you dig your fork into this fluffy bowl of spiralized carrot “rice” leek risotto with bacon, you won’t believe it’s not real rice. It’s quick, gluten-free, paleo-friendly and dairy-free. If you just bought a spiralizer and need new recipe ideas, look no further! Ali, from Inspiralized loved her spiralizer so much, she created a blog dedicated to spiralized vegetables. First off, ever since I started food blogging, I’ve been a fan of Skinnytaste. Now, I’m not just saying that because Gina kindly let me share a recipe here today. When you first start off as a healthy food blogger, you can’t help but discover Skinnytaste and immediately start drooling. Needless to say, she’s been an inspiration to me from the beginning. In June 2013, I started my food blog, Inspiralized. Inspiralized is a blog dedicated to cooking with spiralized vegetables. Yes, that’s right. All of my recipes use vegetable noodles! Imagine my happy surprise when I saw Gina’s Zoodles and Meatballs, her Asian Turkey Meatballs and Zoodles with Lime Sesame Dipping Sauce and her Zoodles with Lemon Garlic Shrimp. Somewhere along those lines, she mentioned that she was on a “zoodle kick.” Welcome to my world, Gina! Like me, Gina wanted to share that spiralized veggies (noodles made of vegetables using a spiralizer) are a healthy, Paleo, gluten-free, unprocessed alternative to regular pasta. Of course, these noodles can also similarly be made with a mandolin or julienne, if you don’t happen to own a spiralizer. Aside from spiralizing zucchinis, there are many other vegetables that can be turned into noodles. Actually, spiralizing is a great way to eat seasonally. For example, over at Inspiralized, I made a lot of butternut squash and sweet potato noodles this winter. While these veggie noodles allow us to make hearty bowls of low-calorie and low-carb pasta, they can also be turned into rice! By simply placing your spiralized vegetables into a food processor and pulsing for a few seconds, the noodles are transformed into rice-like “bits,” perfect for using as rice. 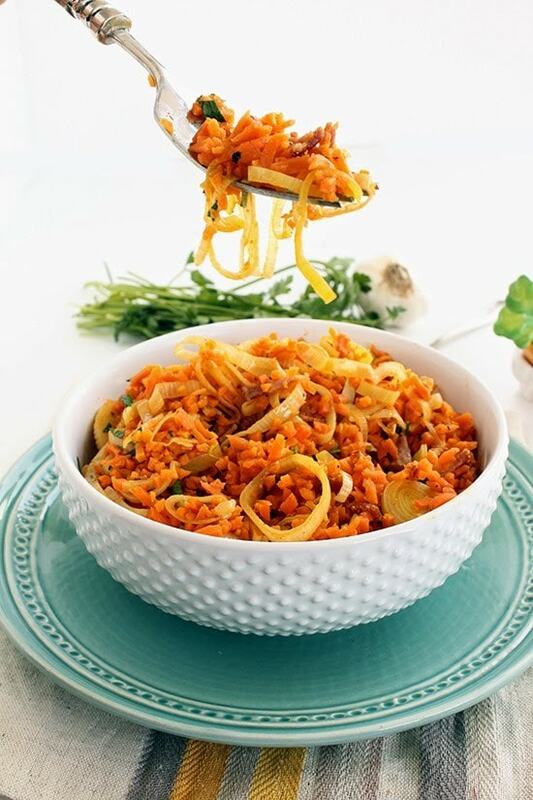 Not only is this “spiralized rice” clean-eating friendly, it’s quicker and easier! No more waiting for water to boil, no more expensive rice cookers and no more accidental mush. What vegetables work best as rice? Any vegetable that doesn’t have a high water content (ie zucchini), such as butternut squash, beets, plantains, sweet potatoes and of course, carrots. 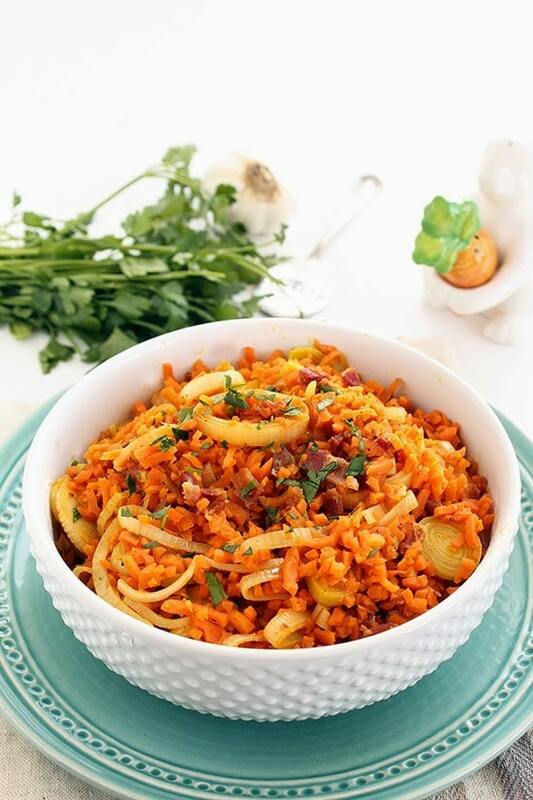 That brings us to today’s recipe: Carrot Rice Leek Risotto with Bacon. Using springtime leeks really gives this dish a fresh seasonal taste. The carrot “rice” is seasoned simply with pepper, garlic, and lemon juice. Add in the salty, richness of the bacon and that’s all you need to make this flavorful and savory bowl of rice. This recipe is not only Paleo, gluten-free and dairy-free, it’s a refreshing, light way to enjoy an otherwise mundane vegetable: the carrot. 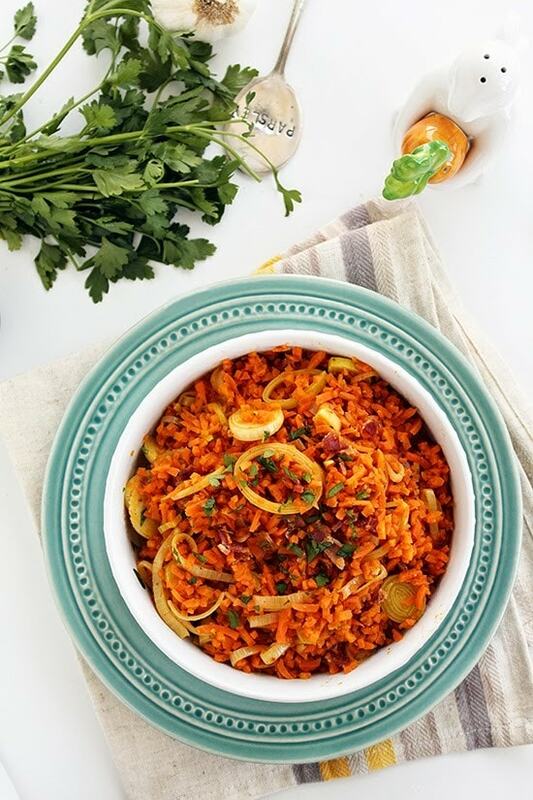 This carrot rice dish saves well when refrigerated, so make a big batch on Sunday and enjoy it at work for lunch or reheat it for an easy weeknight dinner. Well, I hope that I’ve Inspiralized you today and that you’re now on your way to the kitchen to make vegetable “rice.” Most importantly, I hope to see you around on Instagram, Twitter, Facebook, Pinterest and on YouTube or Vimeo. Thanks again to Gina – I can’t wait for the Skinnytaste cookbook! Place a medium skillet over medium heat. Coat the skillet with cooking spray and then add in the slices of bacon. Cook the bacon for about 5 minutes or until almost crispy. When done, remove the bacon with tongs or a slotted spatula and set aside on a paper-towel lined plate. While the bacon is cooking, place your carrot noodles into a food processor. Pulse for 5-10 seconds or until the noodles turn into rice-like bits. Set aside. In the same skillet with the bacon grease, add in the garlic and leeks. Stir to cook for 1 minute and then add in 1 tbsp of the vegetable broth. Stir to combine again and season with pepper. Let cook for 1 minute and then add in the rest of the vegetable broth. Let reduce until the liquid is fully absorbed. Taste the “rice.” If the carrot is no longer crunchy, it’s done. If not, cook covered for 3 more minutes. While the rice is reducing, dice your slices of bacon. Set aside. When the rice is done, fold in the diced bacon, stir to combine and then pour into a bowl. This is absolutely delish! I made as is except I didn’t have leeks so I subbed shallots. This was so tasty. Very filling. I will be making this again and again. Thanks! P.s. I didn’t spiralize the carrots as I had thin carrots. Just chopped and pulsed in the processor and they turned out just perfect. Looks delicious! spiralizing is a great way to eat seasonally. For example, over at Inspiralized, I made a lot of vegetable salads using HGE amazon. com/Home-Garden-Elements-Premium-Vegetable/dp/B00GNK73A6/ie=UTF8?m=A3FAGJZRGGGUAJ&keywords=spiral+slicer spiralizer. Its easy to clean and handle as well. This was absolutely delicious! I do not have a spiralizer either–nor did I have large carrots. What I did have was a food processor and baby carrots. I grated the baby carrots long-ways with the food processor and then pulsed to get the strings into bits. Worked just fine! Just wish I would've used more leeks! Okay no way can I find such large carrots! How do you spiralize normal size carrots??? I made this tonight and it was very good!! How do I rice it if I don't have a sprilizer? Going to make this tonight. The recipe is for 1 serving. If I make it for 4, do I just quadruple everything? Does anything change in the instructions? I've never heard of the spiralizer, but I want one now. I love the idea of having my veggies as pasta or rice. Can't wait to try recipe!! Has anyone tried making this minus the bacon? I was excited enough after seeing the zuccini noodle recipe last week that I ordered a spiralizer from amazon.ca (and it's back ordered, so who knows when I will actually get to try…) and now I'm excited to try this recipe as well. Quick question though–I haven't used this tool yet and I'm wondering if it works well with more normal sized veg. That carrot in the video is MONSTROUS. Thank you! I just got a Veggetti spiral slicer (found in Walgreen's "As Seen on TV" section) and although it works like a dream on zucchini, I haven't tried it on carrots yet. Tonight I'll put it to the test and hope to make carrot rice for this dish! I have the spiralizer like you use on my Amazon Wish List. The only reason I haven't purchased it is I'm short on storage space. The Veggetti fits easily in my kitchen tools drawer. I look forward to trying more of your recipes!! Love the recipe from Ali!! So fresh and Springy! Totally love our spiraliser too! Means I can eat a huge bowl of "pasta" without all the calories. And its so versatile, Asian style noodles, Italian pasta all the delicious things! I haven't tried spiralizing carrots yet and I'm really intrigued by the idea of processing them after to make them rice-like. Thanks for sharing this!!!! This is such a clever way to incorporate carrots into a recipe. 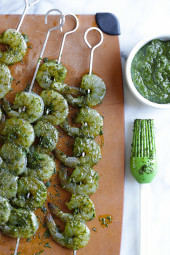 I will have to give this a try– I could definitely use some new weeknight meals. Thanks for sharing! 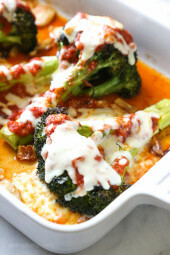 So happy that you have gotten the opportunity to do a guest post on skinnytaste! You are on your way to big things! And wow this dish looks sensational. I'm always looking for dishes to make that are healthy substitutes of things that I know I shouldn't be eating. Can't wait to try it! OMG, I feel like I HAVE to get a spiralizer NOW!!! I loved the zuccini noodles, and now this… Great post Ali. I just ordered a "spiralizer" this week from Amazon … I can't wait to try these recipes … down 100+ lbs with WW. This is going to be great!!! What a great idea!! My fiance loves carrots so I can't wait to try this out! I am so happy to see Ali featured on your blog today! I am a huge fan of both sites and I can't wait to try this dish. Ali – I love your creativity in the kitchen! The things you come up with amaze me! THis recipe looks fantastic!!! I Have never seen a sprializer…is there another kitchen tool i can use? Or would simply shredding the carrot work for this recipe? 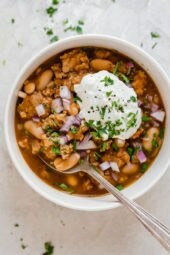 Thanks for featuring my recipe today! I hope everyone likes it – I sure did!